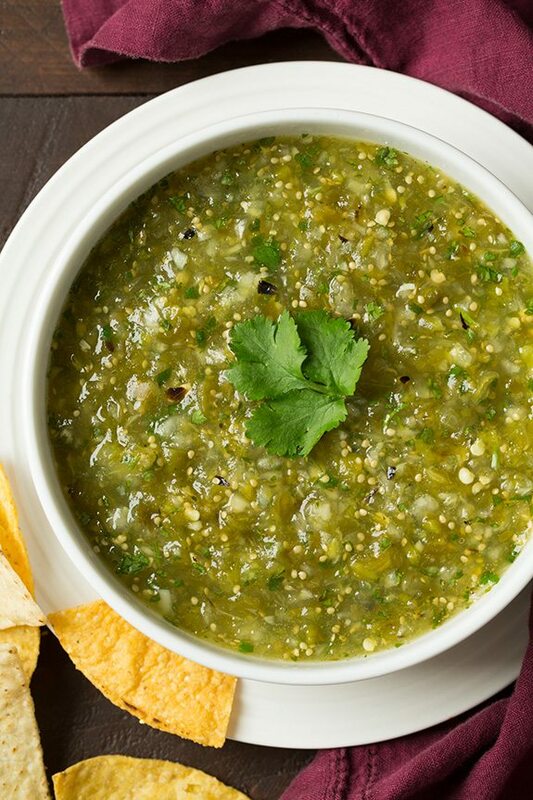 Homemade Salsa Verde is so much better than what you get in a bottle! 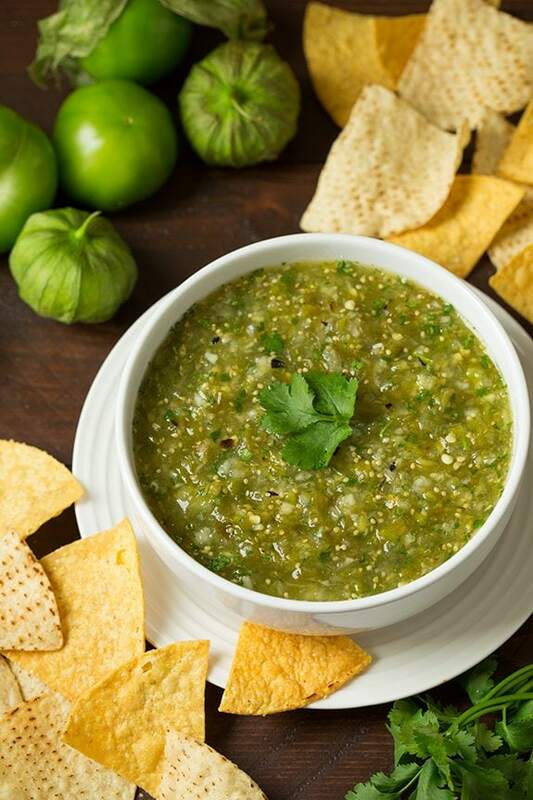 This green salsa recipe is so easy to make, it’s deliciously flavorful, and it makes a delicious topping to your favorite Mexican and Southwestern food. Or simply serve it with chips for a perfect party appetizer or dinner side dish. This is a roasted version of green salsa —nothing overly roasted or too far blackened for my liking, just a fair char on two sides and a quick blitz in the food processor. I definitely prefer this roasting method over the raw versions or boiled versions. Move oven rack about 4-inch below broiler element. Preheat broiler to high heat. Rotate veggies to opposite side and roast until charred on opposite side, about 3 – 5 minutes longer. 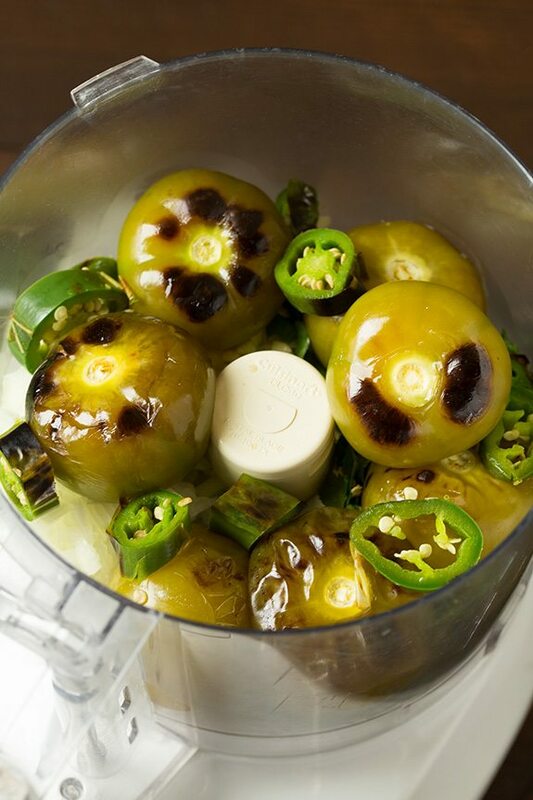 Slice pepper then add to a food processor along with onion, cilantro, garlic, salt, sugar, lime juice, water and tomatillos (and any juices on pan). Pulse several times to a coarse puree. Stir in more water to thin if desired. Chill through in refrigerator in an airtight container. Why Mince the Onion and Garlic First? So you’ll end with some texture in your salsa by the time the tomatillos have processed rather than just a puree (I used some of this salsa to make enchiladas, so if you want to use it for that you won’t really need the texture. You can also add in chicken broth in place of the water and a bit more of it). Is it Necessary to Add Sugar to Green Salsa? Yes, the sugar balances the acidity from the tomatillos and adds depth to the homemade salsa verde. Don’t worry, you won’t taste it at all! Is This Salsa Verde Really Spicy? 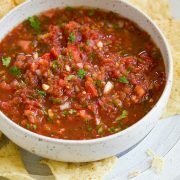 The jalapeño adds a decent amount of heat to this salsa, but not too much. If you don’t like spicy foods, remove the seeds from the pepper before blending it in with the other ingredients. Press tomatillos, they should be firm (not rock hard but a good firmness) skip the squishy overripe ones. Peel back husk slightly to check color, they should have a nice yellow or green color. Skip those that are shriveled or with blemishes. Store in fridge for longer shelf life, unlike tomatoes they’re fine chilled. Try to buy tomatillos of roughly the same size so they cook evenly in the oven. Stir in a few tablespoons of water to thin the salsa, if desired. Don’t over mix the salsa verde. You want it to be slightly chunky and have good texture! 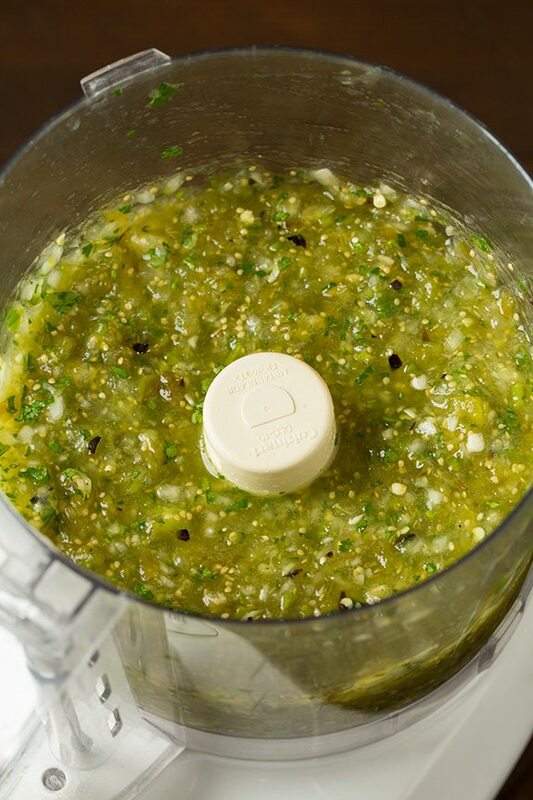 This is my favorite Salsa Verde recipe! The tomatillos and pepper is roasted for a rich, lightly charred flavor then the ingredients are chopped in a food processor for a quick finish. 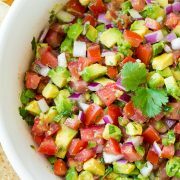 Such a bright refreshing chip dip or taco topping. Move oven rack about 4-inch below broiler element, preheat broiler to high heat. Place tomatillos and jalapeno on a baking sheet then place in oven and roast about 4 - 5 minutes until charred on top (keep a close on on things as they can char pretty quickly - especially the pepper). Rotate veggies to opposite side and roast until charred on opposite side, about 3 - 5 minutes longer. Don't over mix the salsa verde. You want it to be slightly chunky and have good texture!